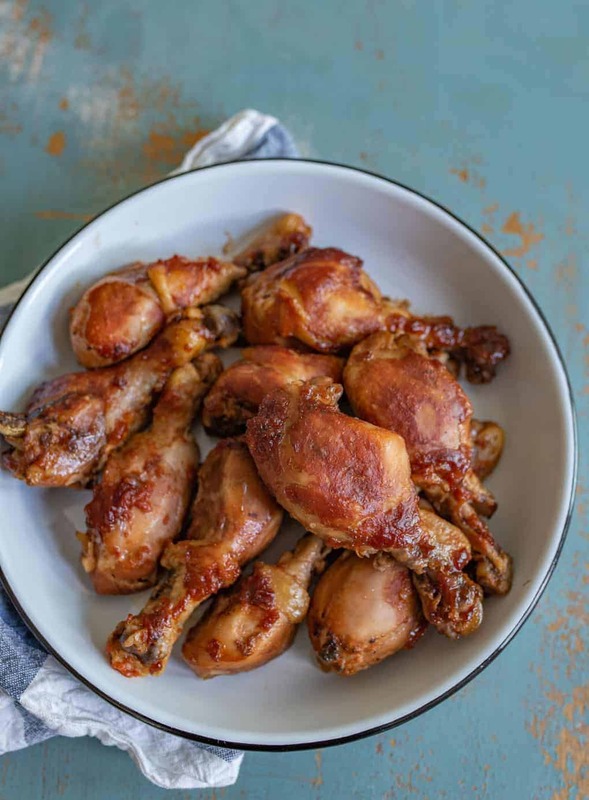 Flavor-packed slow cooker chicken legs take 10 minutes to put together, are easy to make, and only have 5 ingredients you already have in your pantry! Looking for a super simple and crowd-pleasing meal for your slow cooker?! 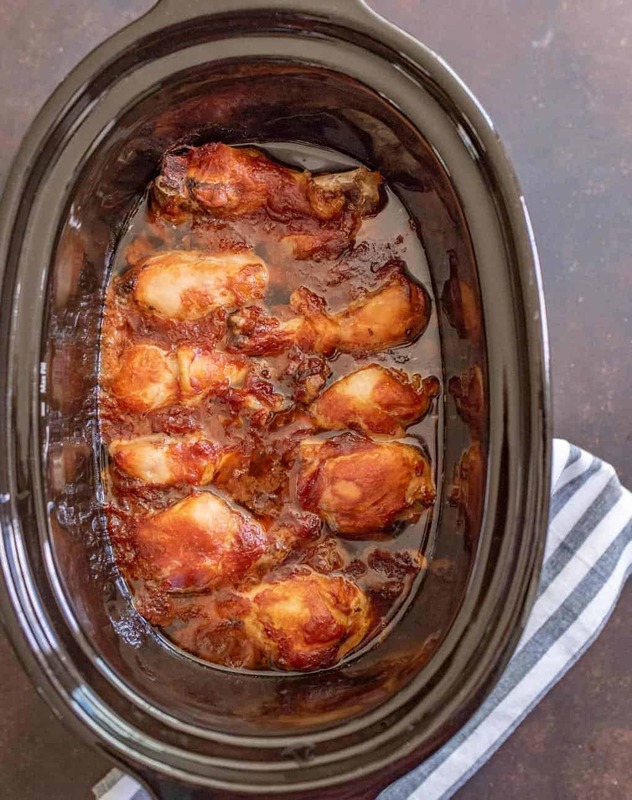 I present to you a recipe that I have made a million and one times – slow cooker chicken legs! 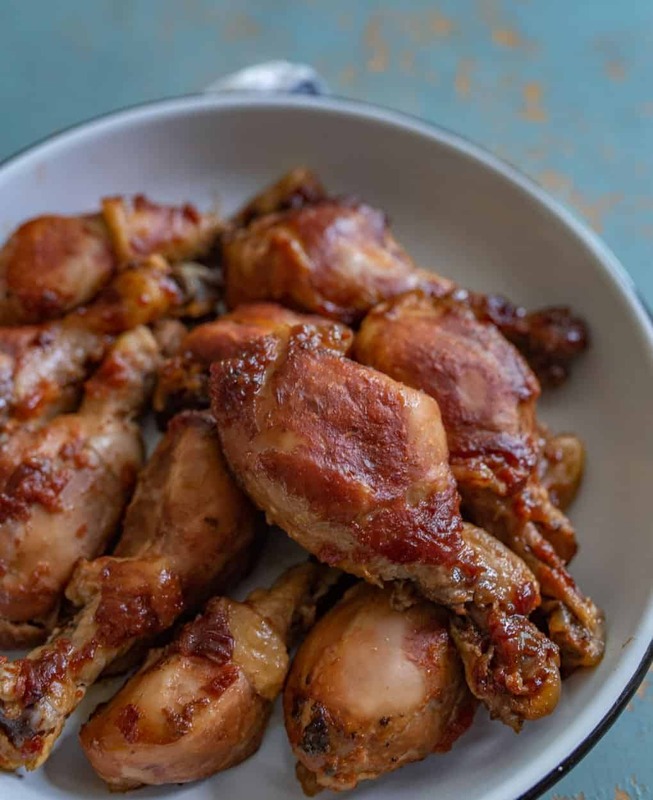 This is pretty much the slow cooker version of our favorite baked chicken legs recipe but it uses jam instead of honey. I love using jams and jellies in this recipe because I always have a lot on hand from the summer months when I was canning and preserving so much. Using jam or jelly is less expensive than honey but still gives the chicken a nice sweet note (without being too sweet) and isn’t overly fruity. 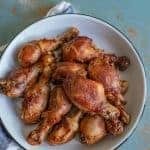 I love cooking chicken drumsticks in the slow cooker because you don’t hardly have to do anything! 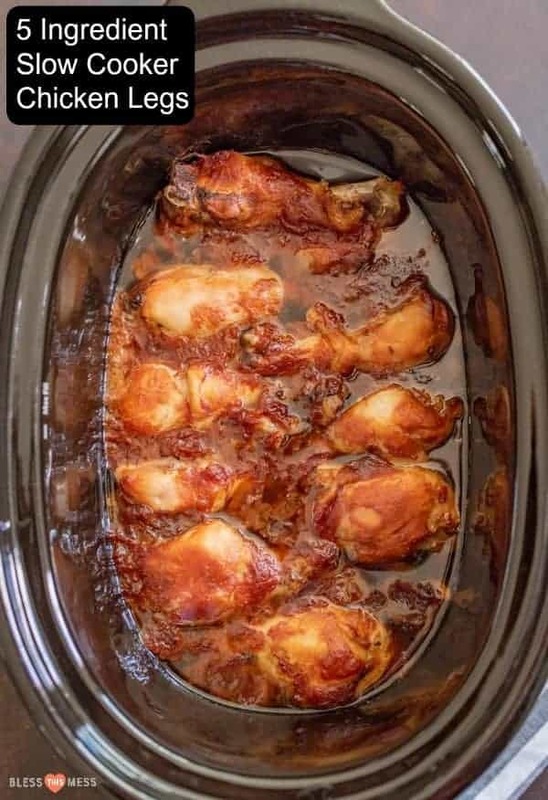 I put the chicken legs in the bottom of the slow cooker, mix together the 4 other ingredients, pour it over the top, add a lid, set a temperature, and I’m done! Ten minutes of hands on time for a great main dish is always a win in my house. Plus I love using chicken legs because my kids eat them well and they are an inexpensive cut of meat. The sauce created from the juices is delicious. Feel free to serve it over rice with your meal. Can you put chicken drumsticks in the slow cooker? Yes! Arrange the chicken legs in a slow cooker. Add your sauce and cover. Set it and forget it. My favorite kind of meal. You can use all kinds of jams and jellies for this recipe. My favorites are grape, apple, apricot, or peach. They have a nice flavor and sweetness without being too fruity. I normally avoid jams with seeds such as blackberry. You can add so many things to these chicken legs! Add a tablespoon or three of Siracha or other favorite hot sauce for some spice, add a teaspoon of Montreal Steak Seasoning for a little bit of smokiness, or throw in some favorite spices like onion powder, cumin, or ginger. It’s very flexible and very versatile. The sauce that the cooking chicken creates is delicious. Feel free to serve it over rice. Add a side of steamed veggies and you have yourself a complete meal. I normally plan on two chicken legs per person as a serving size. This is a great recipe for a crowd and scales up and down really nicely. 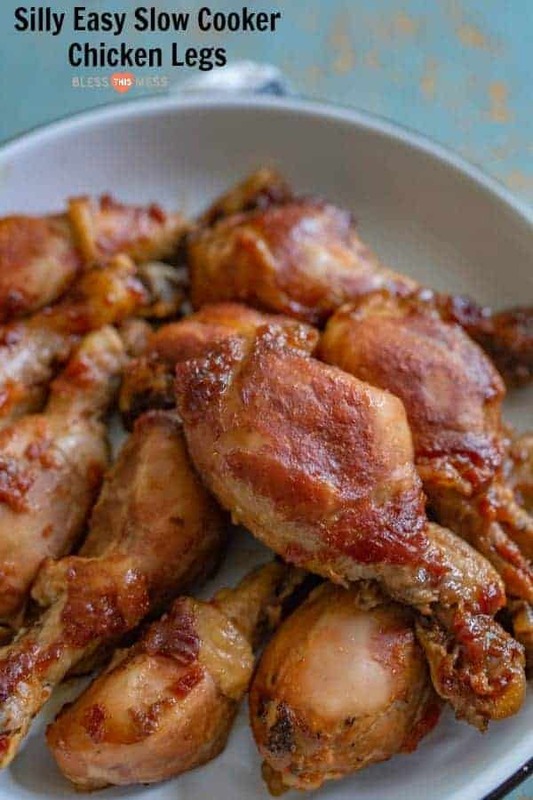 If you like your chicken legs a little crispy on the outside, you can remove them from the slow cooker after they’re finished cooking and put them on a rimmed baking sheet. Brush them with additional sauce left in the slow cooker. Broil them in the oven for around 5 minutes until you reach your desired crispiness. Place the chicken legs in the bottom of the slow cooker. In a small bowl add the jam or jelly, ketchup, soy sauce, and garlic. Mix to combine well. Pour the sauce over the chicken legs. Place the lid on the slow cooker and cook on high for 4 hours or low for 5-6 or until the chicken is cooked through. So many great chicken and slow cooker recipes! I hope you have time to make this one because it’s a keeper. Long live the easy slow cooker recipe that gets dinner done! I hope you love it. While the flavor was very good my husband didn’t care for the chicken legs. I was wondering what your thoughts are on maybe using chicken breast instead. I just don’t love chicken breast in the slow cooker, but that’s me. I think it’s totally worth trying if you like chicken breast because you’ll get a similar result. I’d check them for doneness with a thermometer few hours in and not over cook them though. Yes honey or even just brown sugar work fine! I used thighs, homemade peach jelly, Worcestershire instead of soy sauce, and shook in some chipotle hot sauce I saw in the cabinet. My wife was amazed, she loved it. Thanks. Yesss! That’s what I love about this recipe, use what you have and it turns out every time! This was tasty. I used grape jelly, ketchup, twice the garlic, and Worcestershire sauce (because my soy sauce hadn’t been opened yet). Six hours on low did the trick. They looked just like the ones in Melissa’s photo. Served over baby potatoes that were cooked in the microwave. Next time I may toss the taters right into the crock pot. Looking forward to also serving it with rice. Seems like it would be great with the canned yams that are languishing in the back of the cupboard. Can of whole-berry cranberry sauce could be used up too. Thanks Melissa. Yay for making it your own! That’s what I love about this recipe, it’s awesome for using what you have! PS… Melissa’s recipe tastes just as good cold as it does hot. So put some in the fridge for a snack, picnic or football game. Great tip! Thank you for that idea!